With an oral examination and x-rays of the mouth, Dr. Jason Hullett or Dr. Anu Hullett can evaluate the position of the wisdom teeth and predict if there are present or future potential problems. Across the board, studies have shown that early evaluation and treatment result in a superior outcome for the patient. Patients are generally first evaluated in the mid-teenage years by their dentist, orthodontist, or by an oral and maxillofacial surgeon. It is recommended to have your wisdom teeth removed as a teenager or in your early twenties when your bone is softer, more pliable and you are able to recover faster. As you age, your bone becomes brittle as well as your teeth. Call our Houston office at Houston Office Phone Number 713-439-7575 or our Sugar Land office at Sugar Land Office Phone Number 281-277-6622 if you have any questions or to schedule an appointment with Drs. Jason Hullett or Anu Hullett today! Wisdom teeth that have erupted straight, are in function (can chew food properly), have no decay and no pain do not need to be removed. When you are in actual pain, the treatment plan to remove wisdom teeth is straight foward. But when you are not in current pain, it is the duty of the oral surgeon to determine if the position of the tooth will become a problem and advise you on the treatment plan to remove the wisdom teeth as a preventative measure. The most frequent clinical problem we see is pericoronitis, (a localized gum infection). Without enough room for total eruption, the gum tissue around the wisdom tooth can become irritated and infected with trapped bacteria / food, resulting in recurrent pain, swelling, and problems with chewing and/or swallowing. If there is inadequate room to clean around the wisdom tooth, the tooth directly in front, the second molar, can be adversely affected resulting in gum disease, bone loss around the tooth, and/or decay. As in the above Panorex, the second molar roots (which you want to keep forever) was eaten away by the wisdom teeth and resulted in loss of the second molar as well. As wisdom teeth develop, the roots become longer and the jaw bone more dense.When it is necessary to remove impacted wisdom teeth in your thirties, forties or beyond, the post-operative course can be prolonged and there is a higher complication rate. Treating these complications is often more difficult and less predictable than with a younger patient. Healing may be slower and the chance of infection can be increased. 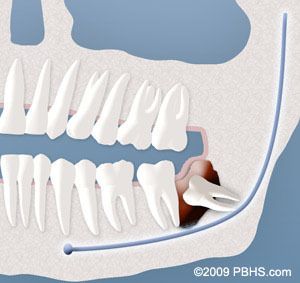 People often rationalize that they are not in pain, so why have the wisdom teeth remove? Commonly, this is regrettable, because pain indefinitely occurs as you age and it becomes more difficult to manage. As trained oral surgery specialists, it is our job to decrease, and even eliminate the risks involved with wisdom teeth removal. It is our recommendation to have non fuctional wisdom teeth removed in the teenage years. 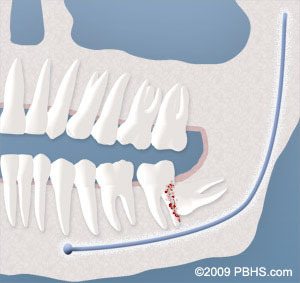 Yes, wisdom teeth extraction is a very common procedure and very likely to be covered by your dental insurance. We are in contract with many PPO insurances which help pay for the procedure and most times, the anesthesia. Every insurance company has a different policy regarding the extent of coverage for a given surgical procedure. The oral surgeon’s office staff will help you obtain maximum insurance coverage for your treatment. During your consultation appointment, the surgeon will need to review your x-rays, complete a clinical examination and determine the best option for anesthesia, before an accurate estimate can be provided. You will be provided with an itemized cost schedule for your review and consent before any surgery is performed. Every code used by our office is examined and verified by the insurance specialist. At the time of your consultation, your specific situation will be discussed in greater detail. We encourage you to ask any questions you may have. If new questions arise after your consultation, please call our office at Houston Office Phone Number 713-439-7575 to speak to one of our patient care coordinators.